This article presents a detailed review on raspberry ketones offered by Health Plus Prime. This product intends to diminish cravings, improve your alertness and focus, and aids in rapid fat burn. This product is manufactured in the United States in a GMP and NSF certified facility. Read on to learn more about this product. Raspberry Ketone is the most active ingredient in this product. It is a natural substance that gives red raspberries their powerful aroma. It is also found in small amounts in blackberries, cranberries and kiwis. Recently it has gained widespread acclaim as a weight loss supplement. Vegetable Cellulose is the other ingredient (inactive) used in this product to aid in easy digestion. This product does not contain fillers, binders, artificial ingredients, Magnesium Stearate, Silicone Dioxide, Titanium Dioxide, wheat, gluten, soy, egg, shellfish, milk or peanuts. The manufacturer advises considering this a dietary supplement that can help you to control your appetite and lose excess body weight naturally. It is recommended to take just two capsules thirty minutes prior to your biggest meal of the day, with a full glass of water. To maximize results, you should take one capsule at least thirty minutes prior to your biggest meal and one capsule thirty minutes prior to a workout or any physical exercise. It is recommended not to exceed two capsules in a 24 hour period. 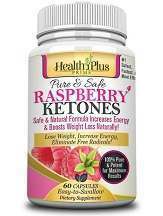 A single bottle of Raspberry Ketones offered by Health Plus Prime costs $14.47 against the manufacturer’s list price of $45. It is available in Amazon for $14.97, however, free shipping is available only for orders over $35. The manufacturer encourages potential buyers and users to join the Health Plus Prime Club for discount codes. A ‘5% off Discount Coupon’ was also advertised in the manufacturer’s website, at the time of writing this review. Although this product is not known to contain any artificial ingredients, the manufacturer advises to seek medical advice prior to the use of this product and follow the directions carefully, as they provide immediate results if used properly. Health Plus Prime is committed to satisfying potential customers which is why they have advertised a 60 day, no questions asked, 100% money back guarantee. If you aren’t satisfied with the product for any reason, all you have to do is just contact the manufacturer and they will work with you to make things right. For additional information on Health Plus Prime’s Return/Refund Policy, it is advised to email or call the manufacturer’s customer support team. There were several reviews available for this product and majority of the reviews had positive feedback. This product is manufactured in a world-class facility that adheres to industry standards. The 60 day, no questions asked, 100% money-back guarantee is extremely encouraging for risk-averse buyers. At the same time, the product is cheap compared to other brands in the field which may mean that it’s lower quality or that you will have to take larger doses due to a lower potency.